A female comedian has taken to the streets of an Australian city to catcall unsuspecting men as they go about their business. Comedian Tegan Higginbotham doled out a series of pick up lines on a handful of men wandering the streets of Melbourne in a bid to flip the lid on sexist remarks as part of an experiment for the SBS show ‘Is Australia Sexist?’. ‘I like your suit, I’d like it better on my bedroom floor,’ the 30-year-old says to a businessman walking pass her. ‘Does the beard match the carpet?’ she says to another surprised man. Footage shows the comedian follow two men in matching suits down a busy street, before whistling at one of them when he turned around. ‘Just admiring the view,’ she said. ‘It’s cute that you’ve gone all matchy-matchy, have you two ever kissed?’ she adds. During one interaction, Tegan asks a man who is sitting next to her on a bench if he’s texting his girlfriend. She proceeds to ask if he’s single, prompting the surprised man to awkwardly tell her he’s gay. Even though the lighthearted sequence delivers some laughs, the message behind it is much darker. The pick-up lines delivered by the comedian are comments women report hearing from men on a day-to-day basis. After finishing the experiment, the comedian said she identified with some of the tactics the men used to brush her off, including ignoring or trying to laugh it off. However, she realised her experiences being catcalled as a woman were different because none of the men were actually scared of her. ‘There’s always going to be that difference, is that if there is a big man standing there yelling at a woman, you’re not going to yell something back you’re not going to joke because you’re always worried about that thing that if well what happens next? How does this escalate?’ she said. The experiment was one in a series of provocative tests featured in the documentary. 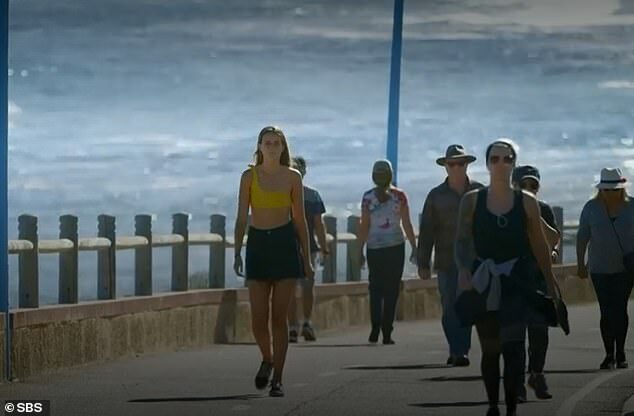 In another test, a 22-year-old woman named Tyler visited a popular beach location in Perth to see how many times she was accosted by passers-by. To assess both sexes’ experiences, a male participant also stood in the same area, doing the exact same thing as Tyler. 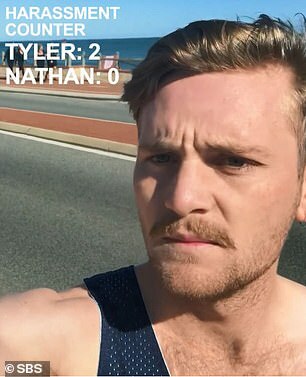 Tyler, who was wearing an off-the-shoulder yellow top and black shorts, was immediately yelled at by men driving past in their vehicles, with one group even shouting ‘get your t**s out for the boys’ as they hurtled along. In total, she was verbally harassed an astonishing eight times in 90 seconds. Nathan, who was wearing a muscle singlet and black shorts, didn’t experience the same treatment once. According to the series and an SBS-funded survey, 22 per cent of men believe wolf-whistling is a compliment to women.